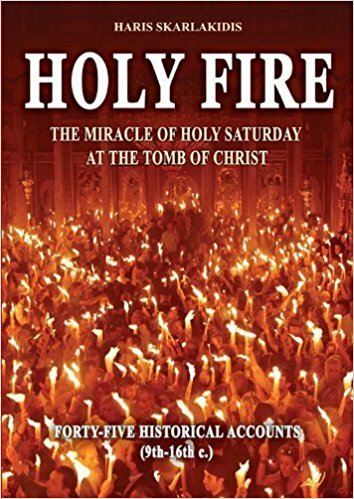 Editor's note: The Holy Fire miracle is alleged to occur every year at the Church of the Holy Sepulchre, which was built over the tomb of Jesus in Jerusalem. On Holy Saturday, the day just prior to Easter on the Orthodox Christian calendar, fire from Heaven is claimed to emanate from above and from within the stone on which the body of Christ was placed after His Crucifiction. The Greek Orthodox Patriarch of Jerusalemn lights his candles from this “miraculous fire” and then distributes the fire to others in attendance. Christians present claim a vast array of supernatural and miraculous manifestations such as a unique “blue lightning” that flashes from within the domed Rotunda outside the Sepulchre and the occasional spontaneous ignition of their own candles in the absence of a heat source. The fire ostensibly neither burns hands nor hair initially. The fire will be delivered via airplane and automobile all over the world in the weeks following Easter. The Orthodox Christian diaspora believes that this event has happened continuously at the burial stone of Christ since His Resurrection. On Holy Saturday, by the Grace of God, a most amazing miracle will occur. How can one be so confident? 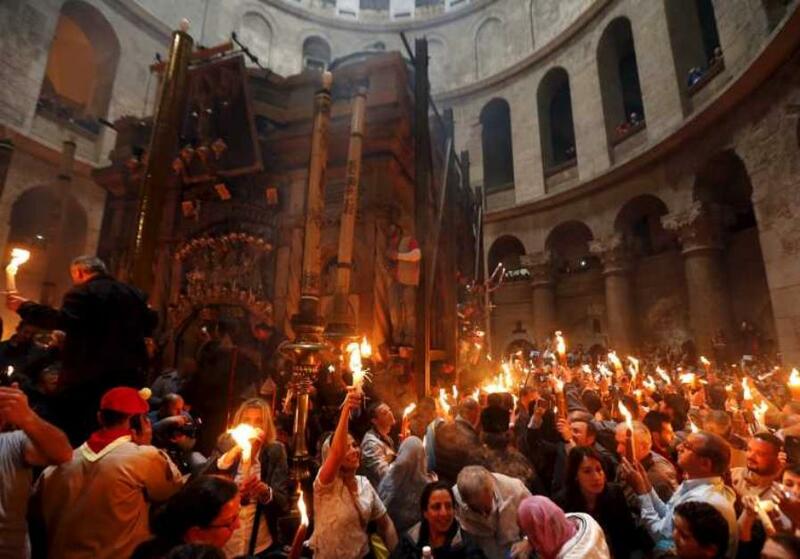 Because the miracle of the Holy Fire has been occurring at the Tomb of Christ inside the Church of the Holy Sepulchre for as long as Christians have been allowed to worship there. It has been chronicled by every society that worshipped in or politically controlled Jerusalem. It has served as an invincible reminder to Christians of both the Resurrection of Christ and the indestructability of His Church. What follows is a brief introduction to a miracle so profound that every Christian should be aware of its occurrence. The source information for this short summation is from Haris Skarlakidis’s wonderful book Holy Fire as well as the website holyfire.org. The large round Rotunda surrounding the Church of the Holy Sepulchre is packed wall to wall with expectant throngs of pilgrims holding torches made of bundled candles. They have traveled from all over the world to see with their own eyes what generations upon generations of Christians before them have also witnessed on Holy Saturday in Jerusalem. The sound of drums reverberates in the energized atmosphere as Christians in red shirts, riding on the shoulders of the strongest among them, exuberantly proclaim “We are the Christians, we have been Christians for centuries, and we shall be forever and ever. Amen!”. The Greek Orthodox Patriarch of Jerusalem enters the Rotunda and processes toward the Holy Sepulchre. He is led by an entourage carrying banners with iconographic depictions of Christ, the Holy Apostles, and New Testament miracles. The Patriarch’s entourage is protected by Israeli security personnel. It is about noon. The joyful tension builds as the Patriarch arrives just outside the doors to the tomb of Christ, prays, removes most of his vestments, is searched for any means of ignition, and prepares to enter the Holy Sepulchre. Before entering, a wax seal is removed from the door. This seal verifies that the tomb has also been thoroughly secured and searched for means of ignition or deception. Something amazing is also happening among the pilgrims anxiously waiting outside the Sepulchre at the very moment that the Patriarch is receiving the Holy Fire inside. Blueish white flashes fill the Rotunda like lightning. The blue light flashes do not cast shadows, nor do they affect the existing shadows already present from the natural light. Individual candles suddenly illuminate. The crowd roars in celebration as the bells begin to chime. 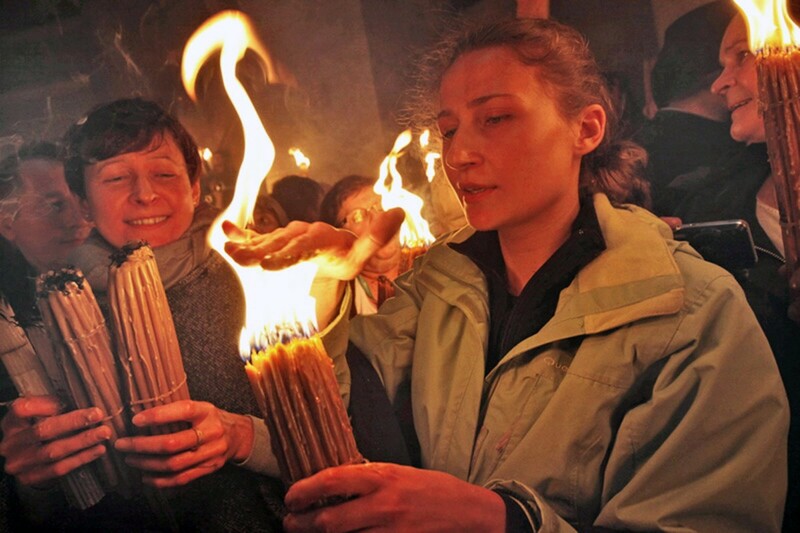 The Holy fire is passed from person to person until anyone with a candle or a lamp is personally experiencing this spectacle before their very eyes. The fire will not burn for at least the first 20 minutes. Those who attend attest that no recording of the event can possibly even begin to convey the spiritual and visual miracles that are taking place amongst the pilgrims. This incredible gift from Heaven takes place at the exact location where the greatest miracle in history, the Resurrection of Jesus Christ, happened 2000 years ago. The signing of the Edict of Milan by Constantine the Great in 313 made Christianity legal again. In 326, the emperor’s mother Helena traveled to Jerusalem and led great excavations that uncovered many of the holiest Christian sites. She had the Church of the Holy Sepulchre erected over Golgatha and the newly discovered tomb of Christ. Sometime between 326 – 331, St Gregory the Illuminator (257-331), a great Armenian Saint and the first Patriarch of Armenia, visited Jerusalem and used the Holy Fire to settle a dispute with the Orthodox Georgians over the proper date for Easter. St Gregory placed a lamp over the tomb of Christ and fervently prayed that the lamp be lit on the correct day for Easter. The lamp was miraculously lit on the date selected by Heaven. Many historical accounts of the Holy Fire followed. The French monk Bernard traveled to the Holy Land to see the Holy Fire in 867. His descriptions of the miracle contributed to the Holy Fire being carried as far as the royal palace in England in subsequent years. During the time of patriarch Athanasius I (927-37) the Muslims placed on iron wick in the lamp on Christ’s tomb. The Holy Fire descended and lit the iron wick. In 1100, the Holy Fire did not appear for the Latin Patriarch until the Crusaders confessed and repented of their sins in the sacking of Jerusalem. The next year, on April 20, 1101, the Holy Fire did not appear at all for the Latin Patriarch. The Holy Fire did appear the next day, Easter Sunday, when the Greek and Syrian Orthodox led their own service in the Sepulchre. It has only been since the Fifteenth century that the Greek Orthodox Patriarch entered the Holy Sepulchre to receive the Holy Fire. The tradition of prior centuries was to recite the prayers from outside the wax sealed doors. The Holy fire would still descend and illuminate the oil filled lamp in the vacant tomb of Christ. On Holy Saturday 1579, the Turkish governors denied access to the Church of the Holy Sepulchre to the Greek Orthodox patriarch, Sophronius IV. The Patriarch and all the faithful remained in the courtyard outside the Sepulcher all day and into the evening. The Patriarch was positioned to the left side of the church doorway, next to a large column. Suddenly, as evening dawned, the base of the column split, and the Holy Fire emanated from the column. 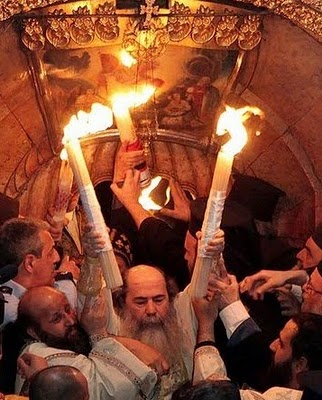 The Patriarch lit his candle from the column and within a few minutes the faithful were awash in the Holy Fire. The Turkish guards, amazed at what they had just witnessed, immediately opened the church doors and allowed the Christians to enter. 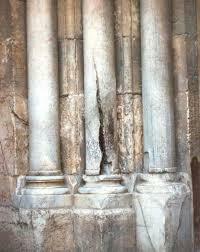 This damaged column is still in existence outside the Holy Sepulcher to this very day. A typicon is a liturgical book that contains instructions about the order of liturgical services used by the Church. The Typicon of Dionysiou Monastery on Mt Athos was published in 1851. It is primarily a copy of the ancient Typicon of Jerusalem. The Typicon of Jerusalem was written by St Sophronius I who was the Patriarch of Jerusalem from 634-637. In it St Sophronius called for “Joyous Light” (sometimes today called “Gladsome Light” or “Joyful Light”) to be chanted at Orthodox vespers in honor of the Holy Fire, which appeared at the tomb of Jesus. This beautiful hymn is central to the evening service (vespers) of the Orthodox Church to this very day. In 2008, Russian physicist and Associate Professor in Mechanics of Materials, Andrey Volkov, headed a scientific mission to investigate the phenomenon of the Holy Fire. He was allowed to set up instrumentation and equipment to scientifically analyze this miracle at the exact moment of its occurrence. 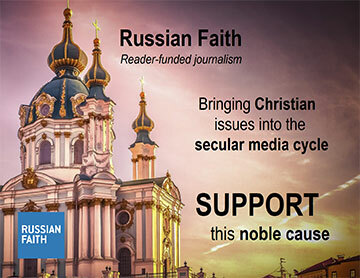 The results of his analysis were published in the April 2012 edition of the Russian Journal of Science and Religion under the article titled “The Miracle of the Holy Fire”. The article was written by Volkov and four other Russian scientists. The article describes “a strong radio pulse…at the moment of the Holy Fire’s descent” and calls the event “majestic”. Their scientific analysis ruled out the possibility of any hoax or fraud. They determined the Holy Fire to be the result of “electrical discharge” and stated, “the nature of such phenomenon is much more complex than than a simple “lightning” during a storm . . .”. They were unable to assign a practical human source for such an electrical discharge, especially given that it happened in the absence of a storm, indoors, and on a reoccurring date. These are but a few of the more than 70 detailed historical accounts in Haris Skarlakidis’s book entitled Holy Fire. Holyfire.org is also an excellent resource as are the myriad of videos available online. Of course, nothing compares to experiencing this miracle of miracles first hand. Sceptics who have gone to witness the Holy Fire, in efforts to debunk it, have come away believers. Their belief, however, was not simply a belief in some amazing phenomenon in the absence of a greater Divine context. The Holy Fire, while experienced primarily via the eyes, transforms the souls of those who allow it. The Holy Fire is not some created substance, rather, it is the manifestation of the Uncreated Light of Christ in our present day. In our age of disbelief, one can easily be convinced that miracles are nothing more than historical fables of the religious. The truth is quite the opposite. Among such miracles is the paradox of the Holy Fire. This miracle, so well documented both visually and historically, continues to occur to this very day. Yet so few know of its occurrence. If you believe, then share this miracle. If you are a skeptic, as was I, then investigate it. You might just be amazed at what you will bring to light.